Water agencies across Southern California have made great strides to reduce water demand and encourage efficiency, but conservation alone won't meet our region's water needs. Population growth is expected to continue across the Southland, increasing water demand at a rate greater than conservation alone can meet. Even with water recycling and demand reduction, many Southern California communities rely on costly and increasingly unreliable water supplies imported from Northern California and the Colorado River. Additional water sources are necessary to ensure long-term reliability. The Colorado River Aqueduct (CRA) has a capacity of approximately 1.25 million acre-feet per year and typically operates well below this level. In fact, in its 50-year history, the CRA has rarely been full, and over the last ten years (since the Colorado River's Quantification Settlement Agreement was enacted among the river basin states), the CRA has never been full. Cadiz water would represent four percent of the CRA's capacity and the project will be engineered and coordinated with CRA operators. In the event there is a year when the CRA has no additional capacity, Cadiz would store project water supplies on the project site at no cost and deliver the water at the first available opportunity. This is most likely to occur in a wet year, when imported supplies are more plentiful and storage would be ideal. There has never been the kind of industrial activity in the Cadiz Valley that has caused water quality concerns in other areas. Water from the Cadiz Water Project will meet or beat all federal and state standards and is safe without treatment, except for naturally occurring Chromium-6 (CR-6). In 2014, California became the first and only state in the U.S. to limit CR-6 in drinking water to 10 parts per billion ("ppb"), compared to the federal standard for total Chromium in drinking water of 100 ppb. CR-6 occurs naturally at levels above 10 ppb in many groundwater sources across California, including the Cadiz Water Project basin where it naturally occurs at levels that slightly exceed the new California standard. 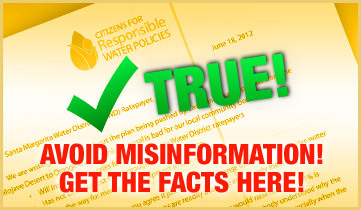 Although a blend of Cadiz water with Metropolitan supplies in the CRA may satisfy the CR-6 water quality regulatory standard, Cadiz and SMWD are sensitive to ensure the Project has the ability to meet any applicable drinking water standards prior to entering the CRA as may be required by Metropolitan. Cadiz, the engineering firm CH2M and water treatment company ATEC Systems Associates announced in August 2015 that pilot tests at Cadiz demonstrated that a new ATEC technology can cost-effectively remove CR-6 at the wellhead to a level substantially below the new California State standard. A secondary benefit of the new treatment technology is the removal of arsenic, although Project water is already below current arsenic standards. The pilot tests were overseen by CH2M and subsequently peer reviewed by multiple drinking water professionals. With implementation of this technology at the Cadiz Water Project wells, all water delivered to the CRA can meet Metropolitan's water quality standards and no water having CR-6 levels above California standards will be delivered to any end user of Cadiz Water Project supplies. The project's environmental review has been conducted in compliance with the California Environmental Quality Act, the most demanding state environmental law in the nation. Cadiz plans to avoid impacts to federal land by building the Water Project pipeline in a railroad right-of-way, thereby avoiding impacts to federal lands and the need for federal permits. In 2002, an earlier iteration of the Project that would have constructed facilities on federal lands underwent a NEPA review and received NEPA approval from the US Department of the Interior. As this former project design was larger and considerably more impactful that the current version, it is expected that the current project, in its more modest form, would receive NEPA approval should such a review ever be conducted for any Project component. Tens of thousands of miles of railroad rights-of-way throughout the Western United States are built across federal lands. The General Railroad Right-of-Way Act of 1875 allowed railroads to authorize uses for infrastructure without further authorization from the Federal Bureau of Land Management (BLM), which manages these lands. It is estimated that there are currently over 3,500 individual instances of third-party uses within BLM-managed railroad rights-of-way, including instances of water pipelines. In 2011, an opinion by the Department of Interior's Solicitor stated that a third-party project in an 1875 Act right-of-way must "further, at least in part" a railroad purpose. The Cadiz Water Project's design incorporated multiple provisions to further railroad purposes, including water turn-outs and automatic fire suppression systems at the railroad's wooden trestle bridges along the pipeline's route, an improved road for better access, hydroelectric generation to provide power to a remote railroad switching yard, improved telecommunications and even a steam-powered tourist train which would use water from Cadiz to generate steam. Therefore, the Cadiz Water Project pipeline, like other infrastructure, should be allowed to be constructed in the railroad right-of-way without further involvement from the BLM. The pipeline was fully reviewed and approved under California's stringent environmental laws and received railroad authorization. The cost of existing water supplies is expected to continue to rise, and dramatic rate hikes are more likely if water sources are not diversified. 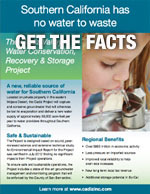 The cost of water from the Cadiz Water Project will be comparable to rates from Metropolitan Water District and more affordable than other new supply programs being considered by water providers. The Cadiz Water Project will provide a reliable water supply and can serve as insurance against supply disruption and rate hikes. The project underwent a comprehensive review under the most demanding environmental law in the nation - the California Environmental Quality Act. More than $10 million has been spent on scientific studies. Leading scientists have reviewed the results, which show project operations will not harm the environment. Decisions by public agencies regarding the Cadiz Water Project have been, and will continue to be, made in public meetings. The public review process has been extended in multiple instances to give the public more time to study relevant documents and make comments, and multiple workshops and hearings have been held.